outline: In this final article in her series on Bhutan, artist and writer Andrea Maguire provides details on the weaving techniques, fibres, dyes and processes used to produce the country’s stunning textiles, and describes a few of Bhutan’s sustainable development and resource-based initiatives. The day begins early for Tenzin. She kneels to adjust her traditional backstrap loom, pulling the warp threads taut. A perplexing array of shuttles wound with vibrantly coloured thread lies ready, as she enters into an ancient and ongoing tradition which has played out day after day for centuries. Tenzin would have played near her mother's loom as a child, and would have been apprenticed at 10 or 11 years of age, as are many Bhutanese girls. It would have taken her a further 10 years to master ornate, intricate and technically complex weaving techniques which require the use of multiple shuttles to give Bhutanese fabrics their unique and mysterious patterns. Just as there are Four Noble Truths in Buddhism, there are Thirteen Traditional Arts — Zorig Chusum in Bhutan — weaving being primary among them. If singing is not one of these, it should be added as the Fourteenth for, as the young weaver builds the rhythm and momentum of her work, it is not long before she bursts into a spontaneous, lilting song. It doesn't take much, in fact, for the Bhutanese to burst into song. Much of the weaving produced in Bhutan is for household use. 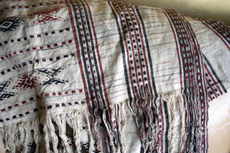 Weaving often involves labour- intensive techniques with a bewildering assortment of seemingly extraneous weft threads, which are woven into the background fabric. These supplementary weft threads are used to produce a unique one-sided over-weaving that creates brocade-like patterns in the fabric, traditionally called kushutara. 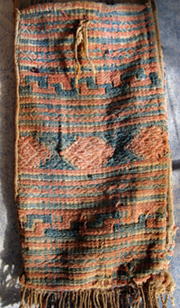 This is a time-honoured method which involves weaving highly contrasted coloured thread into a white ground. Another use of this one-sided supplementary thread method is to create an embroidery-like effect called timah which, contrary to what was once thought of as embroidery, is woven into the fabric during its production. Alternatively, supplementary weft weaving also allows for interesting two-sided cloth designs that create intriguing positive/negative patterns. It is no wonder that it can take anywhere from weeks to months to complete a single length of intricately patterned cloth. The width of a woven fabric is limited by the width of the traditional loom — usually a little under 60 centimetres (24 inches). This necessitates the piecing and sewing together of a number of lengths of woven fabric to create a usable width of cloth. The piecing and stitching of the cloth is a good way of estimating its age and determining the source of its production. Each piece of weaving is highly original. The weaver expresses her own artistic vision in almost limitless adaptations of certain basic motifs and techniques and a wide variety of colour combinations, so that no two pieces are quite the same. The symbols and motifs in contemporary production tend to be geometric in nature. Patterns using the diamond and half-diamond are the most widely used, in inexhaustible variations. Human and animal forms are evident generally in older textiles, and may be inherent symbols of the ancient and animist Bon religion of the region. The more prevalent designs tend towards a preference for Buddhist symbols, such as the series of interlinking diamonds used to create the “knot of infinity”, or the butterfly-like double diamond motif representing the dorje, or thunderbolt. Another fundamental pattern uses a series of triangles in successive rainbow colours, the rainbow being a prime motif in Buddhist iconography. However important the application of diverse variations in pattern and design might be, the richness of colour, in all aspects of textile production, remains of primary value. The merit of the weaver is measured in her appreciation of colour combinations; thus, each woven piece remains an individual work of art. Red and blue are the most traditionally used colours, and were usually woven into a plain white ground. 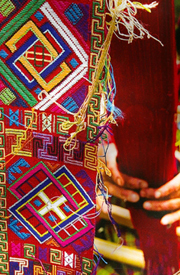 Traditionally, the Bhutanese have relied on local natural dyes, and the practice of using indigenous, regionally produced, dyes and fibres remains common. There has been an influx of commercially produced fibres, and commercial dyes are becoming more prevalent due to their low cost, reliability and range of colours. However, the Bhutanese are fiercely protective of their traditional heritage and highly value, even patent, their weaving designs. Photography is not allowed inside the National Weaving Institute for the same reason. 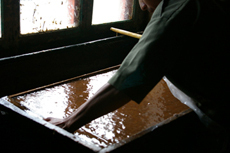 Secrecy also surrounds traditional dyeing methods, due to the difficulties involved in the time-consuming and labour-intensive collection and production of the dyes. Red dye is still traditionally produced from the collected resinous secretions of the lac scale insect — the word “lac” is synonymous with the rich red colour it produces. Red is also produced using the local madder plant. Blue is traditionally prepared through a complex process which extracts the dye from the leaves of the indigo plant, and yellow is traditionally produced from turmeric or the indigenous symplocous plant. 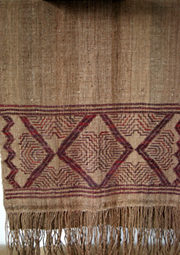 The rich brown of this contemporary handwoven piece was created with a natural dye made from walnuts. 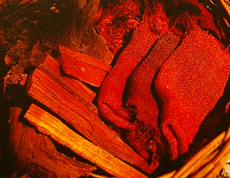 Yak hair fibres, being long and coarse, are used in the production of unique and beautiful utility products which require strength an durability, such as pack bags, cord and belts. The National Women's Association of Bhutan (NWAB) is strong in itssupport of local community initiatives, and is central to grassroots sustainability programs which educate women in indigenous weaving techniques, give women a measure of financial independence, and support business schemes at a very basic level. Although NWAB focuses primarily on education and on setting up local women's groups, they are also involved in many other initiatives which promote the development of local industries and manufacturing that depends on, and utilizes, local and indigenous resources. One such project that I visited is a local papermaking factory, which uses the local daphne plant that grows prolifically in the mountainous eastern region to produce a beautifully rich and durable paper. Production of lemongrass oil at a very basic, local level has also become a successful and growing venture: local distilling tanks dot the rugged countryside, and have been set up for local people to use in the collection and distillation of the oil. 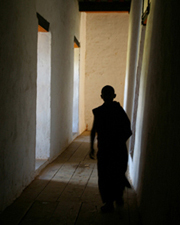 Bhutan is at a crossroads, its time-honoured practices spanning many centuries of history. The future lies with increased foreign incursion into the land and culture of this intensely proud people, protective of their customs and heritage. New, exciting and innovative ideas are inevitably gaining ground and, as Bhutan faces future challenges — embracing the newness of global communications, new technologies and economic incursions — it also inscribes upon these its own ideals of continuity. Local ingenuity and the adaptive nature of the Bhutanese people offer avenues for developing and refining their most precious arts and traditions.